Swamiji's name is Thiru Santhanam. His native place is Thindivanam, Tamil Nadu. He is a retired Government Servant, presently aged 74 years. We are running a Sabai in the name of "Thaipoosam Paal Kavadi Sabai." 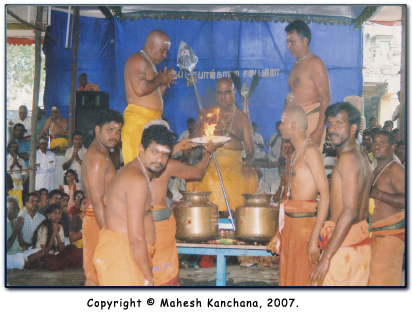 Swamiji's elder father was a Siddhar. 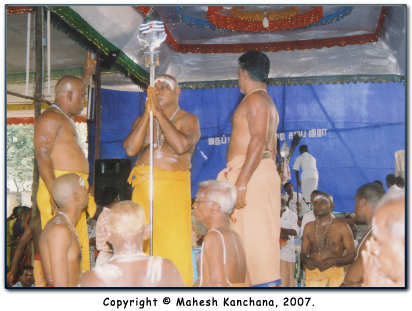 Swamiji received all Sastras and upadesam from his elder father at the age of 8 yrs. During his childhood, Swamiji's grandmother called him every day for dinner. During that time, she would close the door and send out Swamiji's parents. She would take rice and mixed kulambu and it in a plate and then divide the portion into two parts. Immediately, one snake would came and eat the rice food offering. 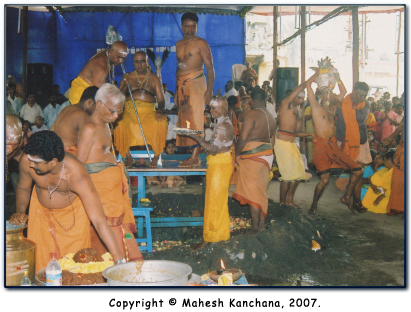 After the snake had taken its food then only would Swamiji take his food, which were the remaining portion of the snake food. 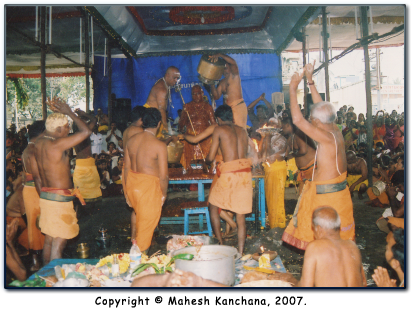 On order of Lord Murugan , every year on Thaipoosam, Swamiji celebrates this festival at Chennai near the Vadaplanai Temple. 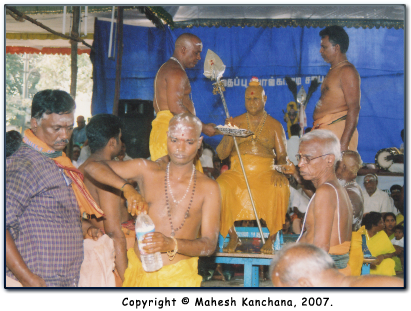 It has known that Swamiji has the sakthi bestowed to him from Lord Muruga. As such, Swamiji has cured some diseases to the local people. In return for his generous service, people would offer money but he would not accept. One example of such a miracle took place with my friend Ravindran. His brother son's two kidneys had failed. In despair, the parents approached renowned doctors in the local area and spent more than 7 lakhs in medical costs, to no avail. Finally, the parents went to Ramachandra Medical College (Porur) and consulted with Dr. Thiru Soundrarajan who informed them that since the two kidneys failed, kidney transplantion was the only cure and it was scheduled to take place within a month. 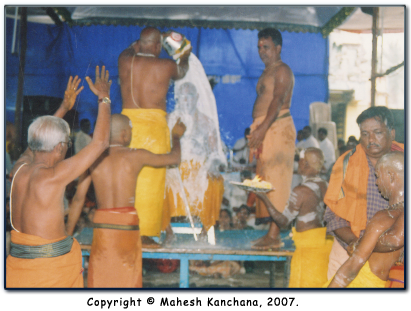 In desperation, Ravindran brought the boy to our Sabai and presented him before Swamiji and narrated the entire story. Immediately, Swamiji told the parents to bring that boy to Viruthachalam the following week along with materials for a Homam (Yajna). 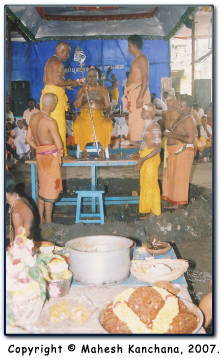 Swamiji went Viruthachalam along with the boy and prayed to Lord Murugan and performed the Homam. He gave the boy to Murugan and then received him back. 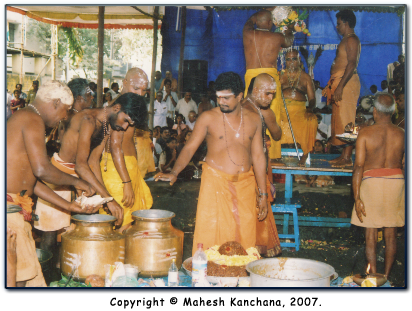 Swamiji and the parents then returned to Madras where they gave the Homam Sambal to the boy to take daily as prescribed. After 15 days, the parents and the boy went to Sri Ramachandra Hospital for a follow-up appointment. Lo! The examination revealed two kidneys found in normal condition! The boy's present age is now 10 yrs. He is studying in a school. Swamiji did the miracle with the blessings of Lord Muruga. 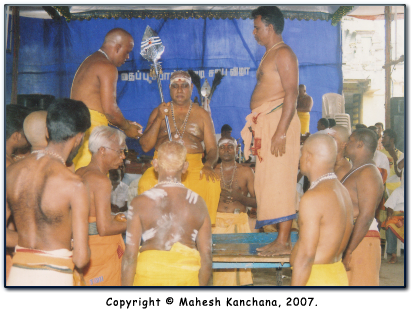 Thaipusam Festival was celebrated at Chennai Vadapalani near Vadalapalani Murugan Temple, TamilNadu, India on 01/02/2007 by the Thaipusam Paal Kavadi Sabai (No. 33 South Perumal Koil Street, Vadapalani, Chennai, Tamil Nadu, India). More than six-thousand people attended this auspicious event.